Like many things in live sound, there are not a lot of real hard and fast rules when it comes to how to mic a choir. The goal is good balance, a natural sound, and high gain before feedback. 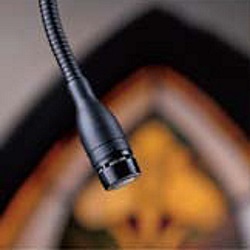 The most popular microphones for choirs are small diaphragm condenser types that are purpose designed, though in certain situations large diaphragm (condenser and dynamic) models can be effective if deployed correctly. Small condenser mics for choir have a cardioid (and sometimes supercardioid and hypercardioid as well) polar pattern that rejects unwanted noise yet offers a wide enough pickup for good coverage, and with solid bass response. These mics are designed to be suspended above the choir from the ceiling or from stands. When placing mics, a critical factor is getting enough gain before feedback while maintaining overall group balance. Attempts to follow the standard 3-to-1 microphone rule within the unique challenges of each individual project should be made. Essentially, it is preferable that the distance between mics is at least three times the distance from each mic to its associated performer, so the leakage signal from the distant performer into the nearer performer’s microphone will be about 10 dB lower – low enough not to be a problem. Most mics specifically for choir applications look similar to this one. Opinions vary somewhat on the height of the microphones. Some recommend placing them at the height of the tallest singer in the back row, while others recommend adding an addition two to three feet to that height. The bottom line is that raising the mics helps make all of the singers equidistant and prevents the front row singers from overwhelming the back row. Via special hardware (gooseneck, clamps, etc. ), the elements of choir mics can be positioned to be raised at an angle (as opposed to pointing straight down). This angling further helps prevent overly loud pick-up of the front row relative to the back row – again, it evens out the distance to all singers, fostering balance. 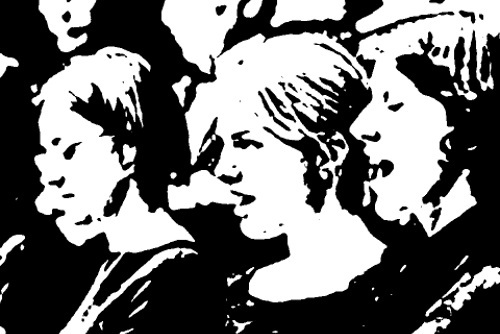 A choir of 30 to 45 voices often requires only two or three mics. “Most people tend to use too many microphones,” explains Thomas Stubics of AKG. “The simple rule is that less is very often more in terms of performance. It’s also important to note that results can vary due to the quality of the actual singing being done. Choir directors can be advised to locate the better singers in the center of the group, promoting vocal strength and cohesion.